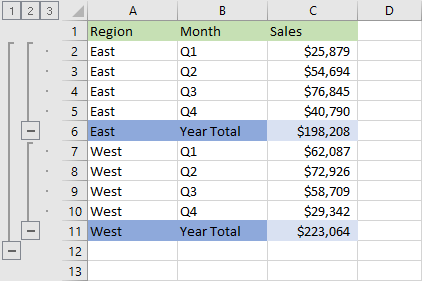 Grouping and then collapsing data in Excel can improve readability. It is especially handy when you deal with lots of data. It represents sales of our products. 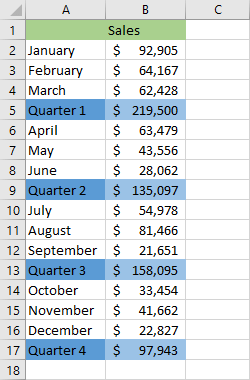 Let’s say that we don’t want to see sales for each month, only a summary for each quarter of a year. We will group cells for each quarter in order to improve our data visually and make it more concise. 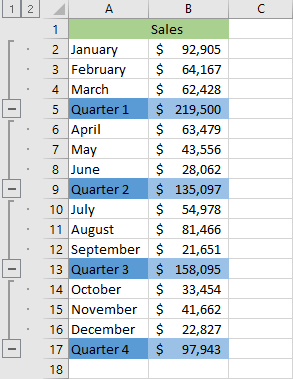 In order to do this, click and drag row numbers, first, for rows 2 to 4. Choose DATA >> Outline and press the Group button. Do the same for the remaining rows (6-8, 10-12, 14-16). Instead of clicking the group button in the ribbon each time you want to create a new group, you can use the Shift + Alt + Right Arrow keyboard shortcut. 1. Individually (by clicking the “–” button). 2. All at once (by clicking the “1” button). 1. Individually (by clicking the “+” button). 2. All at once (by clicking the “2” button). To ungroup rows, first select rows to ungroup, then choose DATA >> Outline >> Ungroup or use The Shift + Alt + Left Arrow keyboard shortcut. You can group cells inside other cells. Look at this example. 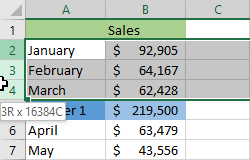 First, select and group rows from 2 to 11. When you have the first group create two other groups (2-5 and 7-10). After you created groups, you have three buttons. “3” – will expand all groups. 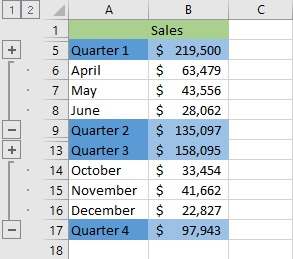 You can groups and collapse columns the same way as you did with rows. 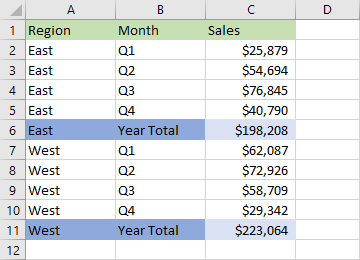 Just select columns and use the group feature.